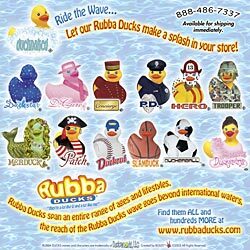 We sell Rubba Ducks! 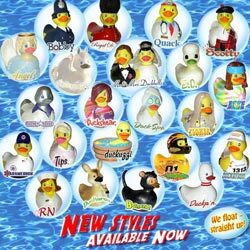 Each of the 200+ Rubba Ducks have been uniquely designed to promote and communicate its individual personality and character. Adding to their individuality, each RUBBA DUCK is adorned with a tattoo reflecting its unique personality on its tail-feathers. And, all of the RUBBA DUCKS have their own hatch dates and engaging biographies, which are found on their trading card tags.